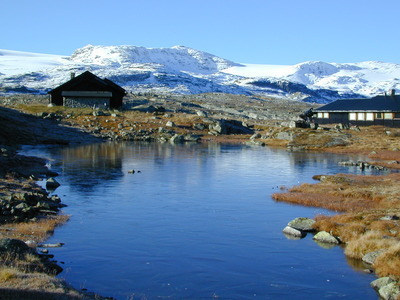 Surviving the winter is a special challenge for herbivorous aquatic invertebrates in the alpine region due to long period of ice cover and cessation of primary production. Daphnids that reproduce parthenogenetically during the summer, with 2-3 generation through July and August, solve that problem with depositing sexually produced resting eggs in the autumn. 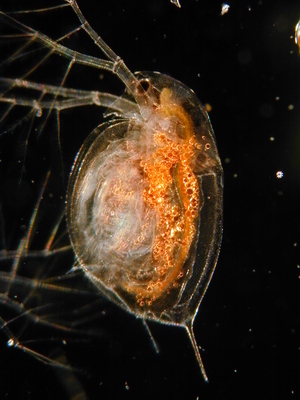 However, the species at Finse, Daphnia umbra, also has an alternative strategy. Instead of producing parthenogenetic or sexual eggs in the autumn, they start storing lipid droplets in the body cavity. Since the pond is not freezing to the bottom, invertebrates can be active under the ice. The temperature is low, giving a reduced metabolism, and if sufficient stored resources are present, a daphnid has the possibility to survive the whole winter. When the winter is over and the food conditions improved, the overwintering adults will have the possibility to start reproduction immediately. Possibly it might be the superior strategy some years, and the eggs in the spring from overwintering adults can be the main base for the summer population. However, surviving the winter in an active phase is dangerous because there are winter active predators and there might be oxygen depletion at the end of the ice cover. If those factor are severe they do not reach to reproduce and the individuals hatching from resting eggs might be source for the summer population. What are the cues that trigger the females in the autumn to choose between producing parthenogenetic female eggs, parthenogenetic male eggs, eggs that can be fertilized resting eggs, or stopping egg production completely and instead filling the storage tissue with lipids. What is the mechanism that lets the two completely different overwintering strategies exist side by side without the one winning over the other. The small pond next the research station.